Cultivate the expertise you need to take your career to the next level. Regent's Doctor of Education (Ed.D.) in Higher Education Leadership & Management is designed to prepare mid- to senior-level administrators at Christian higher educational institutions for positions of significant administrative leadership. Higher job responsibilities lead to higher compensation. Gain the expertise needed for high-profile job positions. Develop vital skills in higher education administration including finance and strategic planning. Effectively manage resources, space and personnel. Apply preventative law measures by understanding historical and contemporary legal issues that have shaped universities, along with constitutional provisions and federal statutes. Critical examination of theories and practices of leadership and communication as they relate to individuals and organizations within the context of educational systems. Theory and practice in analyzing qualitative data. Topics include coding, meaning generation and validation. Examines strategic planning and the role of program evaluation in the planning/implementation/evaluation cycle to include the curriculum planning process. Topics include various theoretical and philosophical perspectives, alternative evaluation designs and related methodologies including collaborative action research and issues related to design, measurement and utilization. The goal is to help educators become active collaborators in the evaluation process and to give them the tools to judge the value of an evaluation. Whether the task is designing an internal evaluation of a local program, contracting for an external evaluation at the district level, or critically reviewing an evaluation report as a basis for making an administrative decision, this course offers important leadership preparation. Each student will prepare an evaluability assessment related to a self-selected educational program in his/her area of concentration. Prerequisite: a graduate level research course. Cross-listed with EDCO 501. Paradigms, processes, elements, and constituents of change. Building upon foundational Biblical models, principles of an effective change process are emphasized from both macro and micro level perspectives. Overview of scholarly research and methods to evaluate research. Presents the basic concepts of quantitative and qualitative research methods and the diverse approaches to scholarly inquiry and reflective practice. Explores the development of a Christian worldview with a particular emphasis on Regent University's mission. Evaluates cultural and educational trends through the lens of a Christian worldview. Descriptive statistics and data-driven decision making in problem-based learning applications. Basic understanding of statistical methods, particularly as they pertain to research in education. Focuses on conceptual rather than mathematical and applied rather than theoretical. Understand why a particular statistical technique is appropriate and how to make sense of the results obtained from its utilization rather than to understand the full mathematical underpinnings of the statistic. SPSS will be used as a productivity tool to perform all statistical procedures. Specific topics include descriptive statistics, visual representation of data, hypothesis testing, regression and correlation. Overview of American higher education from the colonial period to the present. Form a foundational understanding of higher education and the origins of contemporary practices and problems within the academy. Investigate diverse institutions such as land grant colleges, historically black colleges and universities, research institutions, liberal arts colleges, religious colleges and universities and access to higher education. Examine and discuss early innovators of higher education and their policies. Cross-listed with EFND 523. Introduction to descriptive statistical analysis and the purpose of statistical treatments and interpretation of results that may identify and inform sound financial and other educational decisions. Pass/No Pass. An advanced examination of current educational issues and contributing factors. Doctoral candidates will work with their dissertation committee to defend their proposal, research and collect data, write and defend five chapters of their dissertation. Each candidate must register for a minimum of 15 dissertation credits. The credits will be equally distributed into 5-credit segments over 3 consecutive semesters. Designed for doctoral candidates who have not successfully defended their dissertation within 3 semesters, as required by the School of Education doctoral program. Students will enroll in this course each semester and work closely with their dissertation committee until they have successfully defended their dissertation as required by the program. Centers on the need for the continuance of Christian colleges and universities in a post-Christian culture. Particular emphasis placed on the strategies, objectives and goals that can best ensure the future continuance of the spiritual mission and Orthodox beliefs of Christian colleges and universities. Cross-listed with EHEA 602. Examines the roles that state and federal accrediting bodies have on the college and university levels. 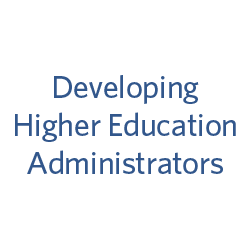 It will give an overview of the dominant agencies like SACS, NCATE, TEAC, etc., and then place them within the context of assessment procedures that must be used for 10-year re-accreditation visits. Particular emphasis will be placed on how an institution can effectively prepare for accreditation utilizing the most recent assessment procedures. Examines the leadership roles and responsibilities of Presidents and Boards of Trustees in higher education. Focuses on new demands for board and presidential accountability, appropriate selection and training of board members, the board's duties in evaluating and compensating presidents, and the president's responsibilities for uniting the board, faculty, and others in meeting the strategic challenges facing the college and university in the 21st century. Focuses on the knowledge and skills required to effectively deal with financial changes and trends for institutions of higher education. Students will further their skills in analysis and evaluation of issues from various perspectives â€“ administrative, consumer and societal (government and organizations in the private sector that influence the source and use of funds). Financial management of higher education (administrative perspective) focuses on effectiveness and efficiency issues associated with the use of funds. The consumer perspective (access and choice issues in financing students) focuses on the source of institutional funds; both state and federal policies and programs and budgeting will inform the learner from that perspective. Cross-listed with EHEA 502. Provides historical and contemporary legal issues that have and will continue to shape colleges and universities today. Discusses legal issues regarding the college and trustees, administrators and staff. Investigates the legal basis of higher education in the United States to include constitutional provisions and federal statutes that influence higher education policy. Prepares emergent administrators for preventative law measures in an increasing litigious environment. Cross-listed with EHEA 503. In-depth study of administrative roles, functions, knowledge and skill requirements, and administrative behavior. Trends in administrative theory and application explored. Dr. Pittman is the concentration chair for Higher Education Leadership & Management and is committed to your success. Dr. Jeff Pittman brings a wide range of experience to his faculty role in the School of Education. He served for over nine years as Vice President for Student Services at Regent University. He has also held Regent positions as Associate Dean for Administration and Academics in the School of Divinity; Assistant Vice President for Administrative and Auxiliary Services; and Assistant Director of Admissions and Financial Aid. Active in several organizations, Pittman is past president (2005) of the National Association of College Auxiliary Services (NACAS). He currently serves on the board of the Council for the Advancement of Standards in Higher Education (CAS). He also serves on the board of the NACAS Education Foundation. In addition to his affiliation with NACAS, Pittman is a member of the National Association of Student Personnel Administrators (NASPA) and the Southern Association of College Student Affairs (SACSA). A prolific writer, Pittman is a contributor to Business Officer, College Planning and Management, College Services, the International Journal of Emergency Mental Health, and Leadership Exchange. Pittman completed his Ph.D. at Old Dominion University, where he was selected as a member of the honor society of Phi Kappa Phi. He earned his MBA from Regent University and his B.A. from the University of North Carolina at Chapel Hill. Pittman holds professional certificates from the Administrative Management Institute at Cornell University and the College Business Management Institute (SACUBO) at the University of Kentucky.